The aim of the present work was to devise, validate and perform a preliminary (small-scale) automated HTS screening campaign to identify novel modulators of Androgen Receptor (AR) activity. 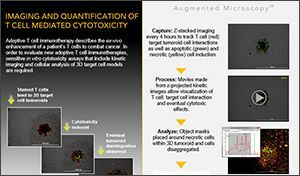 The study incorporated a new whole-cell, luciferase-based assay to quantify human AR activity. 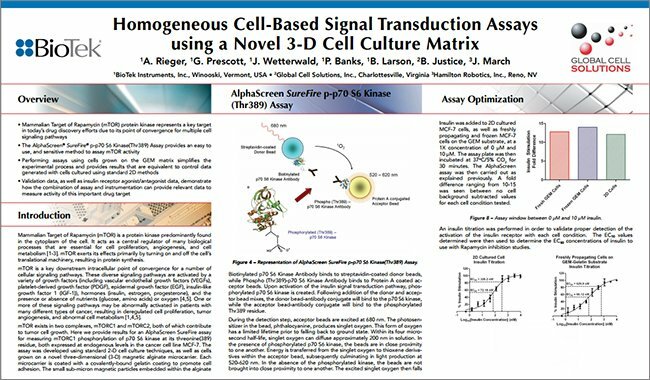 Chemicals identified in the primary screen as putative AR inhibitors were further analyzed using a live cell multiplex assay. The multiplexed assay incorporates a fluorescent Calcein-AM assay to monitor viable cell number, as well as a luminescent AR assay, which were performed sequentially in the same assay well. Automation of the initial library screens was carried out using easy-to-use, robust instrumentation. 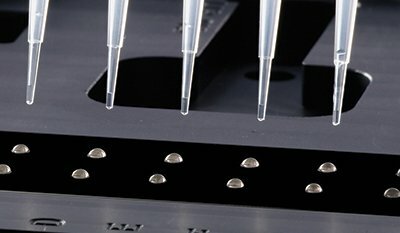 An 8-channel liquid handler was used to prepare serial dilutions of library and reference compounds, followed by their transfer into 384-well assay plates. 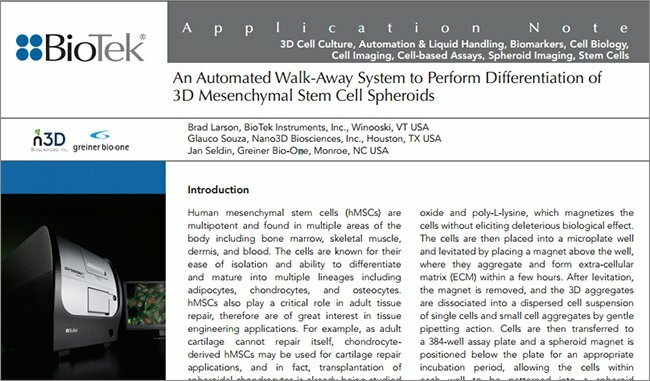 Subsequent additions of AR reporter cells and detection reagent were performed using a high-speed non-contact reagent dispenser. 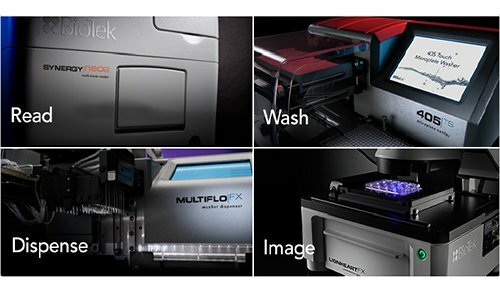 A combination washer/dispenser, capable of media and reagent removal, as well as dispensing cells and other components was then used to perform the live cell multiplex assay. 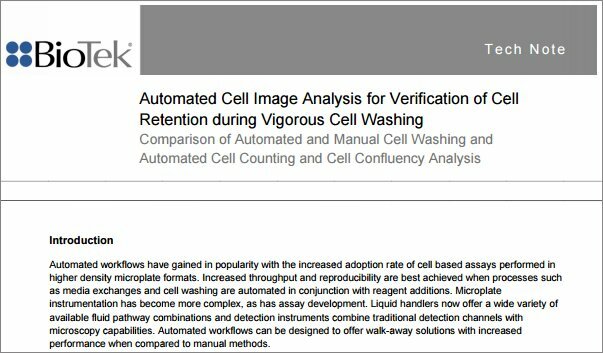 Results demonstrate how the combination of the novel, cell-based chemistries and automation can be used to rapidly, and accurately identify modulators of this important drug target. The Androgen Receptor (AR) is a member of the family of nuclear receptors responsive to steroid hormones. AR activity is regulated through the binding of androgenic hormones (eg., testosterone and di-hydroxy testosterone). 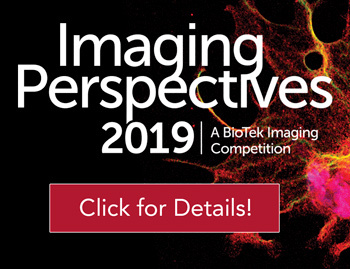 In turn, AR functions to regulate the expression of a myriad of genes involved in metabolic processes, cell proliferation/ apoptosis, and male sexual differentiation and development. AR dysfunction often has severe health implications, such as androgen insensitivity syndrome and prostate cancer. Consequently, AR commands much attention as a target for the discovery and development of improved drugs. In particular, anti-androgens comprise an important class of drugs used in the treatment of prostate cancer. The aim of the present work was to devise, validate and perform a preliminary (small-scale) automated HTS screening campaign to identify novel modulators of AR activity. The study incorporated a new whole-cell, luciferase-based assay to quantify human Androgen Receptor activity. The performance and specificity of this AR assay were first confirmed using a small commercial library of known nuclear receptor modulators. The validated AR assay was then scaled-up and deployed to screen a library comprising 506 diverse small-molecule compounds of natural origin. The natural compound library was functionally interrogated to identify both activators and inhibitors of AR. Chemicals identified in the primary screen as putative AR inhibitors were further analyzed using a live cell multiplex assay. 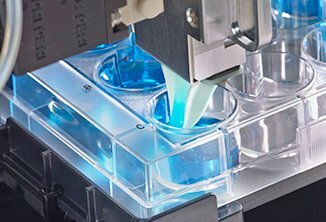 The multiplexed assay incorporates a fluorescent Calcein-AM assay to monitor viable cell number, as well as a luminescent AR assay, which were performed sequentially in the same assay well. Using this format, cytotoxic compounds that elicited false-positive ‘hits’ were eliminated from further consideration. Test compounds displaying novel bio-activities to AR, either agonist or antagonist, were further analyzed to establish relative potency values. 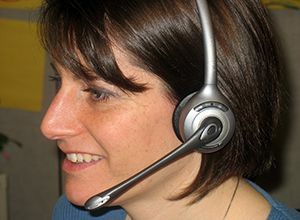 Automation of the initial library screens was carried out using easy-to-use, robust instrumentation. 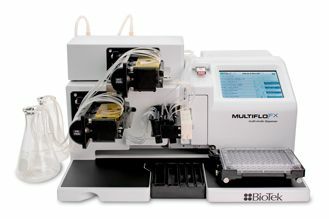 An 8-channel automated pipetting system liquid handler was used to prepare serial dilutions of library and reference compounds, followed by their transfer into 384-well assay plates. 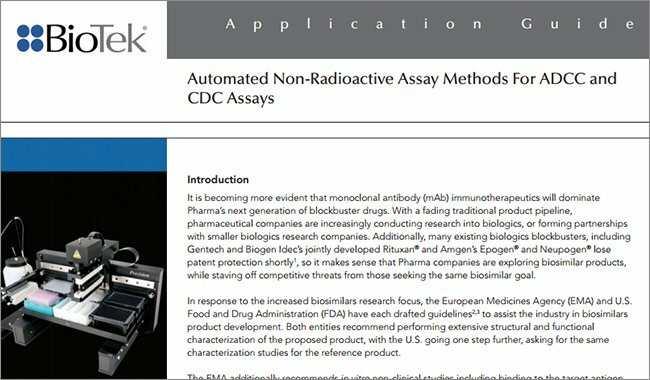 Subsequent additions of AR reporter cells and detection reagent were performed using a high-speed non-contact reagent dispenser. 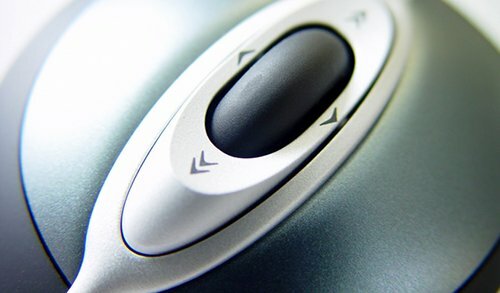 The small footprint of the instrument, as well as capability to autoclave the dispensing pathway, allowed for sterile manipulations during the assay process. A combination washer/dispenser, capable of media and reagent removal, as well as dispensing cells and other components was then used to perform the live cell multiplex assay. 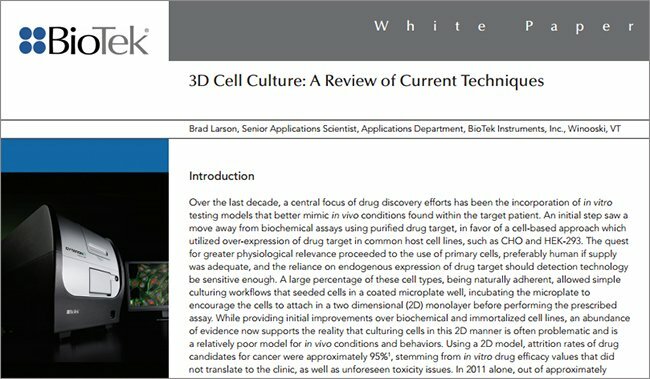 Results demonstrate how the combination of the novel, cell-based chemistries and automation can be used to rapidly, and accurately identify modulators of this important drug target. Screen-Well® Nuclear Receptor Ligand Library (Catalog No. 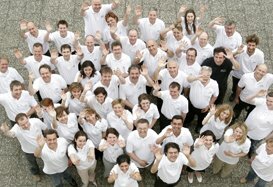 BML-2802) and Screen-Well® Natural Product Library, v. 7.2 (Catalog No. BML-2865) were generously donated by Enzo Life Sciences. Human AR Reporter Assay System, 384-well format (Catalog No. 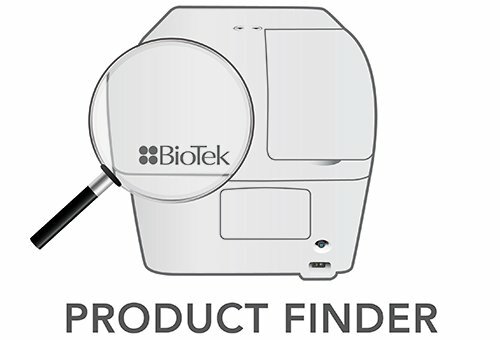 IB03002), and Live Cell Multiplex (LCM) Reporter Assay, 96-well format (Catalog No. LCM05) were provided by INDIGO Biosciences. 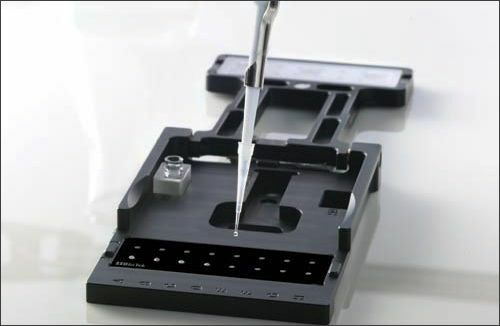 The Precision™ Microplate Pipetting System combines an 8-channel pipetting head and an 8-channel bulk reagent dispenser in one instrument. 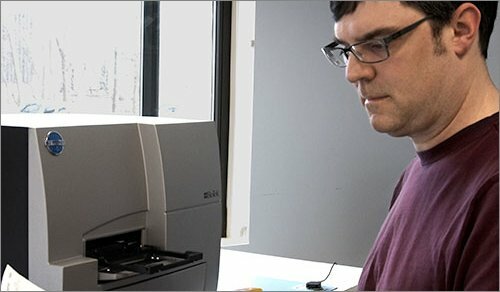 The instrument was used to dilute the library compounds, create compound dose response curves for validation and secondary screening, and transfer all compounds to the 96- and 384-well assay plates. 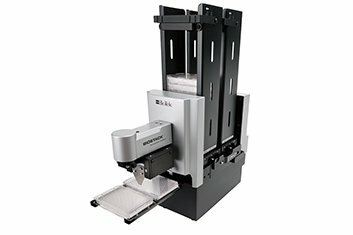 The EL406™ Combination Washer Dispenser offers fast, accurate media removal and plate washing capabilities through its Dual-Action™ manifold. It also offers reagent dispensing capabilities through the use of its peristaltic or syringe pumps. The instrument was used for cell dispensing, media removal, buffer wash, as well as LCMA and detection substrate addition. 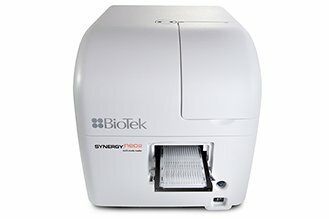 The Synergy™ H4 Hybrid Multi-Mode Microplate Reader combines a filter-based and monochromatorbased detection system in the same unit. 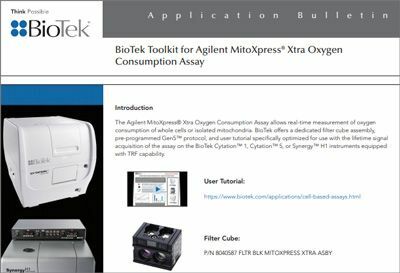 A dedicated luminescence detection system was used to quantify the luminescent signal from the Androgen Receptor Assay, while the filter-based system was used to detect the fluorescent cell viability signal, which is part of the Live Cell Multiplex Assay, using 485/20 nm (Ex.) and 528/20 nm (Em.) filters and a 510 nm cutoff mirror. Reporter cells include the luciferase reporter gene functionally linked to an AR-responsive promoter. Therefore modulators of AR activity will lead to an increase or decrease in luminescent output, relative to a basal signal. 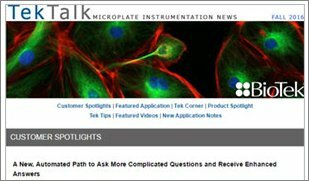 The assay allows secondary screening of test compounds to assess cell toxicity. 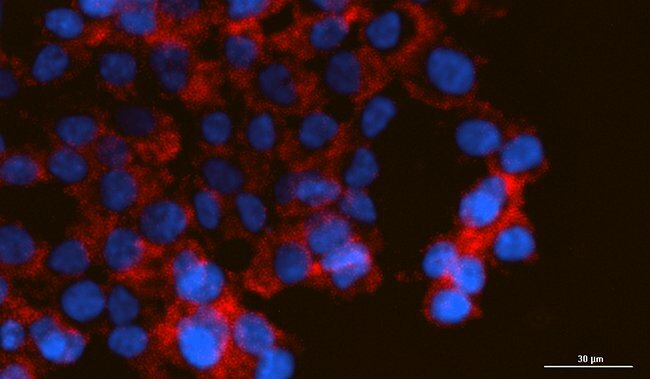 In addition to the reporter system, the assay also utilizes the fluorogenic substrate Calcein-AM (LCMA Reagent) to provide a quantitative measure of the relative number of live cells remaining in the assay wells following exposure to test compounds. In this way “False-positive” antagonist hits are identified and eliminated from further analyses. Figure 1. Human Androgen Receptor Reporter Assay. 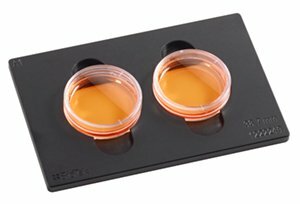 Diluted compounds and reporter cells are added to the 384-well assay plates. Following incubation at 37o C/5% CO2, detection substrate is then added, and the luminescent signal is quantified. Figure 2. LIVE Cell Reporter Assay. Following cell and compound addition and incubation, media is washed from the wells and the LCMA reagent is added. The cell-permeable molecule, once taken into the cells, is hydrolyzed to generate the fluorescent molecule Calcein by endogenous esterases found in intact living cells. Following incubation at 37o C/5% CO2 the fluorescent signal is quantified. LCMA reagent is then removed from the wells and LDR is added, as with the AR Reporter Assay System. The luminescent signal is then quantified, which is proportional to AR activity in the well. 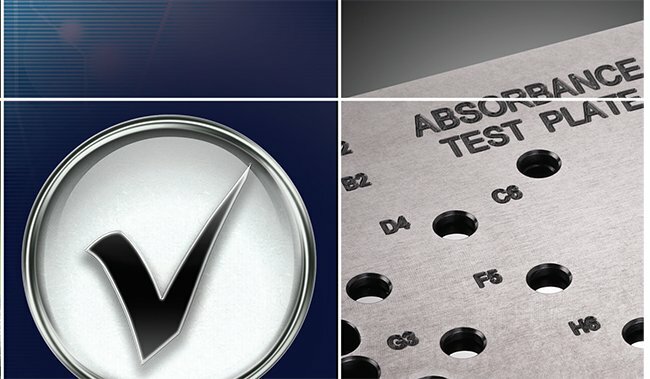 A Z’-factor test was performed to validate the automated 384-well AR assay. 6α-Fluoro-testosterone (6α-FIT) was used as the control compound. Twenty-four replicates of 10 μM or 0 μM compound were used as the positive and negative control, respectively. Dose response curves were also created using the control agonist, 6α-FIT, and the control antagonist, Bicalutamide (BIC), to validate the ability of the automated assay to generate correct compound pharmacology. Figure 3. Z’-factor validation data. Z’ values ≥ 0.5 are indicative of an excellent assay according to Zhang et al., 1999. Figure 4. EC50 value of 71 pM for 6α-FIT, and IC50 value of 96 nM for BIC are equivalent to values previously generated using manual methods. The Z’-factor value generated demonstrates the robustness of the automated assay procedure. 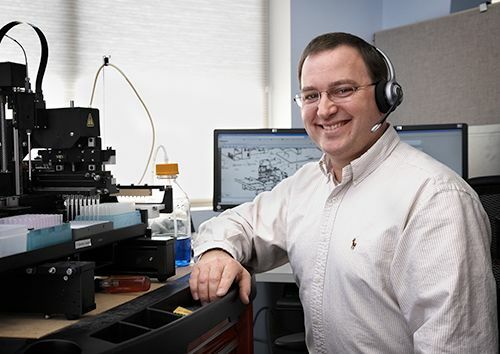 The similarity of EC50 and IC50 values between manual and automated processing also illustrates how accurate, dependable data can be generated using instrumentation. The 76 member Screen-Well® Nuclear Receptor Ligand Library, containing compounds with known bioactivity to Nuclear Receptors, was used to validate the automated 384-well Human Androgen Receptor Assay setup for screening purposes. Figure 5. Human Androgen Receptor Assay, Agonist Validation Screen using Screen-Well® Nuclear Receptor Ligand Library, BML-2802. Test compounds were prepared at three sub-concentrations, then screened (n=6) at the following concentrations for agonist activities against AR: • 10 μM, • 2.0 μM, and • 0.40 μM. 0.1% DMSO ( ♦ ) was included as the vehicle control. 6α–Fluoro-Testosterone, a common reference agonist for AR, is resident within the library ( ▪; Well G1). Fold-activation is defined as [RLUTest Cmpd / RLUVehicle Control]. Table 1. Summary of Positive Hits from the Androgen Receptor AGONIST Screen. Figure 6. Human Androgen Receptor Assay, Antagonist Validation Screen using Screen-Well® Nuclear Receptor Ligand Library, BML-2802. Test compounds were prepared at three sub-concentrations, then screened (n=6) at the following concentrations for antagonist activities: • 10 μM, • 2.0 μM, and • 0.40 μM. AR Reporter cells were pre-treated with 200 pM (~EC75) of 6α–Fluoro-Testosterone as the challenge agonist. 0.1% DMSO ( ♦ ,vehicle) and 5.0 μM Bicaluatamide ( ▪, Reference antagonist) were tested as controls. Mifepristone, another common reference antagonist for AR, is resident within the library ( ▪; Well G3). Foldinhibition is defined as [RLUVehicle Cmpd / RLUTest Control]. Table 2. Summary of Positive Hits from the Androgen Receptor ANTAGONIST Screen. The luminescent signal from library compounds was compared to those generated from vehicle control wells containing 0.1% DMSO only, to generate foldactivation and fold-inhibition values. Hits were defined as compounds having fold values ≥ 3 for two of the three concentrations tested. Results from known AR agonists and antagonists, such as 6α–Fluoro- Testosterone and mifepristone, demonstrate the utility of the automated 384-well Human Androgen Receptor Assay to accurately detect AR modulators. The 506 compound Screen-Well® Natural Product Library was then screened using the automated 384- well Human Androgen Receptor Assay. The library was chosen to examine whether novel AR modulators could be identified within the compound set. Figure 7. Summary of AGONIST “Positive” compounds from the 506 member Screen-Well® Natural Receptor Ligand Library, BML-2865, Version 7.2. Test compounds were prepared at three subconcentrations, then screened (n=1) at the following concentrations for agonist activities: • 1:1,000, • 1:5,000 and • 1:25,000. 0.1% DMSO ( ♦, vehicle) and 10 nM 6α–Fluoro-Testosterone ( ▪, Reference agonist) were added to each of the six 384-well assay plates. Table 3. Summary of Positive Hits from the Androgen Receptor AGONIST Screen. Figure 8. Summary of ANTAGONIST “Positive” compounds from the 506 member Screen-Well® Natural Receptor Ligand Library, BML-2865, Version 7.2. Test compounds were prepared at three subconcentrations, then screened (n=1) at the following concentrations for antagonist activities: • 1:1,000, • 1:5,000 and • 1:25,000. AR Reporter cells were pre-treated with 200 pM (~EC75) of 6α–Fluoro-Testosterone as the challenge agonist. 0.1% DMSO ( ♦, vehicle) and 5.0 μM Bicaluatamide ( ▪, Reference agonist) were added to each of the six 384-well assay plates. Table 4. Summary of Positive Hits from the Androgen Receptor ANTAGONIST Screen. 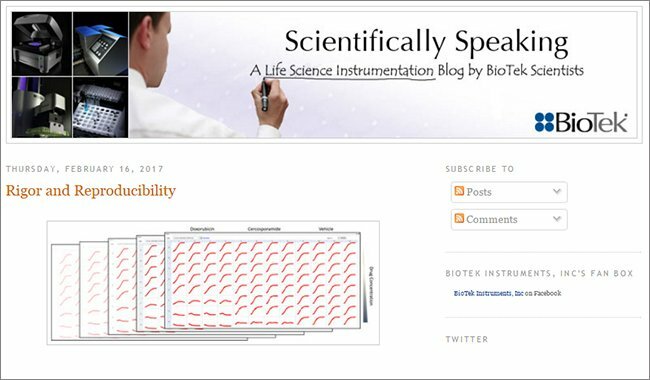 The primary screen of the Natural Product Library delivered a hit rate for the agonist assay of 0.4% and 5.2% for the antagonist assay. The hit rate is consistent with typical results from similar screens. Compounds demonstrating positive AR agonist or antagonist activity were confirmed using two different methods. Positive agonists were further tested using “Mock” reporter cells, which contained the luciferase reporter gene construct without expressed Androgen Receptor. In this way, compounds which induced luciferase expression in the absence of receptor activation could be removed from further consideration. Compounds demonstrating agonist activity from the Nuclear Receptor Ligand and Natural Product Libraries were tested using the “Mock” reporter cells. The confirmatory assay showed a single compound, Cytochalasin E, to be a false activator of receptor activity, as all three concentrations of the compound tested exhibited luciferase induction. 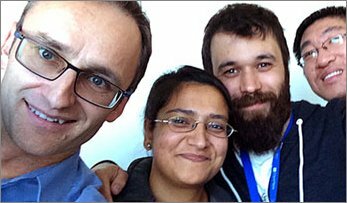 Putative “positive” antagonists were further evaluated using INDIGO’s Live Cell Multiplex (LCM) assay. Compounds were tested at their highest HTS assay concentrations. Figure 9. Secondary screen of Agonist-Positive compounds against “Mock” Receptor Cells. 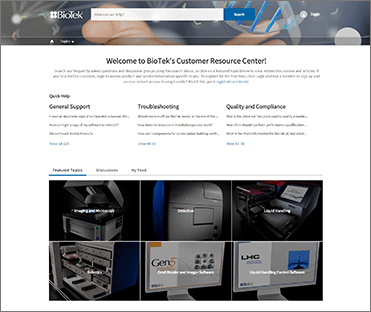 Screen- Well® Nuclear Receptor Ligand Library, BML-2802. (• 10 μM, • 2.0 μM, • 0.40 μM) Screen-Well® Natural Product Library BML-2865 Version 7.2 (• 1:1,000, • 1:5,000, • 1:25,000). Table 5. 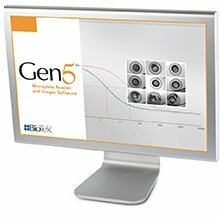 Results of LIVE Cell Multiplex and AR Antagonist Assays. Compounds yielding greater than 90% live cells at the assay endpoint were scored as true inhibitors of AR activity. Compounds yielding between 90-50% live cells may be cytostatic, and were included in additional analyses. Compounds yielding <50% live cells are cytotoxic, scored as ‘false positive’ antagonists, and were then removed from further testing. Finally, full dose-response curves were generated using the confirmed positive AR agonists and antagonists to determine EC50 or IC50 values. Figure 10. Summary of agonist “Positive”compound dose response test following “Mock” Receptor Cell confirmation. Titrations were begun at 10 μM, with the exception of 6α–Fluoro-Testosterone in panel B (33.3 nM) and Solasodine (4.8 μM). Points on each curve represent Avg ±SD of n=3 points. EC50 values are reported for each dose response curve. Original primary screen concentrations represented below curves in BLACK, except for Solasodine which are represented in PURPLE. Figure 11. Summary of antagonist“Positive” compound dose response test following Live Cell Multiplex Assay confirmation. Titrations were begun at a 1:1000 dilution of the original stock compound concentration. Points on each curve represent Avg ±SD of n=3 points. IC50 values are reported for each dose response curve. 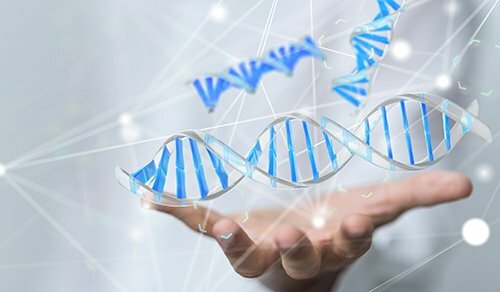 The data demonstrates that the Human Androgen Receptor and Live Cell Multiplex assays provide easy-to-use, rapid methods for the assessment of Androgen Receptor activity and cytotoxicity in a cellbased format. 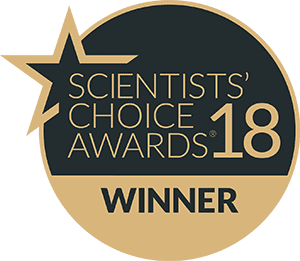 Cryopreserved cells further simplify the assay procedures and provide increased repeatability during the primary and secondary screening process. 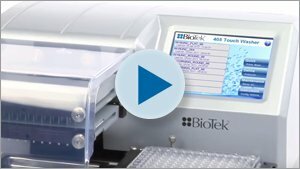 The Precision™ and EL406™ are able to easily titrate and transfer library compounds, dispense cells and reagents, and perform the media and buffer removals necessary during the LCM assay. 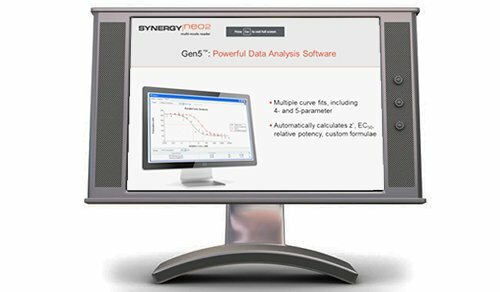 The Synergy™ H4 is also capable of detecting the luminescent and fluorescent signals from each of the assays, without the need to change the optical setup of the instrument. The combination of assay, cells, and instrumentation provide an ideal solution for primary and secondary screening of compounds to determine their affect on Androgen Receptor activity.